Hi, there! I’m new to Apple products, and I recently bought an iMac and an iPhone. I want to figure out a way to transfer several photos from my Mac computer to iPhone. Any helpful suggestions will be appreciated, thanks! If you are new to iOS devices, you may wonder how you can manage media files between your iPhone and your Mac computer. In fact, with the help of iTunes, you can easily sync files to your iPhone, including music, photos, books, etc. The files will be saved in the iTunes library, and you can sync one library to your iPhone manually, or start the auto sync of iTunes to sync all files in your iTunes with your iPhone every time you plug iPhone into computer via USB cable. But excepting for iTunes, there are other methods to help users know about how to transfer photos from Mac to iPhone. It is not uncommon if the users want to know how to transfer photos from Mac to iPhone. When the users have found a photo on their computer, and want to transfer it to their iPhone as a wallpaper, they’ll need to sync the photos to iPhone with iTunes. Transferring photos from Mac to iPhone is easy to be done, and as mentioned above, users can manually sync a folder from iTunes to iPhone. 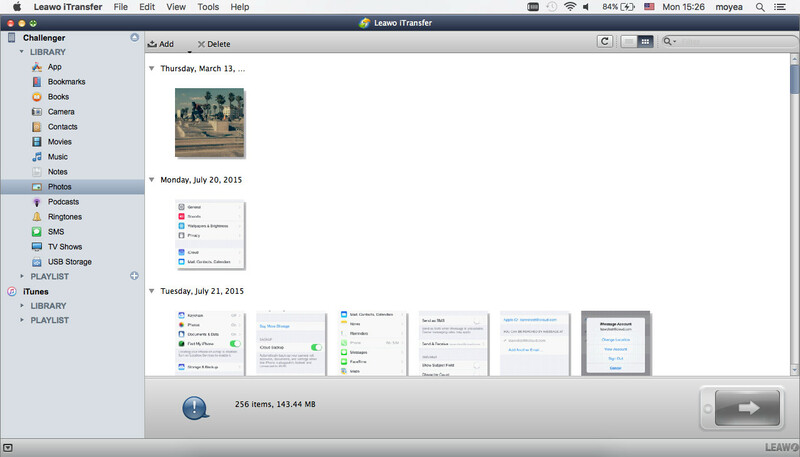 With iTunes installed on the Mac computer, iPhone users are able to sync photos from computer. The photos will be saved in the Photo Library on your iPhone, and they can be viewed and edited on your iPhone. 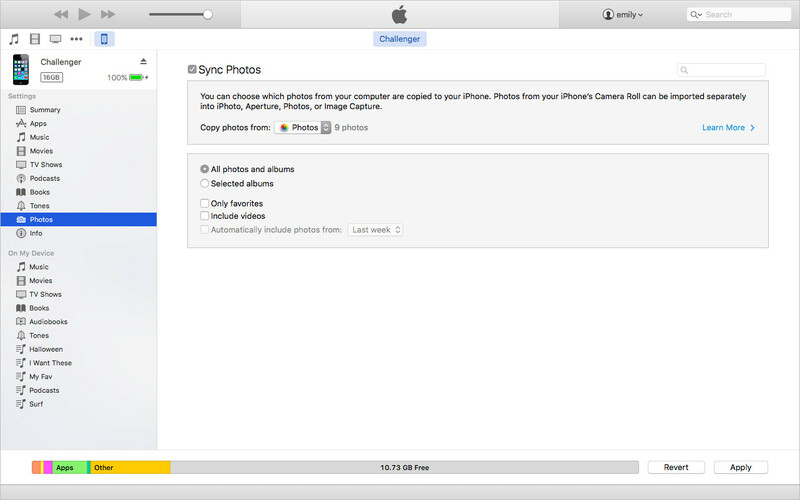 For the freshmen of iOS devices, the following guidance will show you how to use iTunes to sync photos. Install and start iTunes on your Mac computer, and go to “Edit > iTunes > Preferences > Devices”, and check “Prevent iPods, iPhones and iPads from syncing automatically”. Plug iPhone into computer via the USB cable, and iTunes will launch automatically. If not, you will need to manually open it. iTunes will recognize your iPhone. Click the iPhone icon at the upper right corner, and then choose “Photos” in the summary panel. Check “Sync Photos from” and then select the folder that you have saved the photos. Then click “Sync” at the right bottom. Then iTunes will sync the folder with your iPhone. When the sync is done, you will get all the photos from the folder to your iPhone. This is a very helpful way to move photos from Mac to iPhone. But note that the photos you have synced before will be erased and replaced with the photos in this folder. The photos synced from computer will be saved in the Photos app, and you are able to view the photos within the app. Synced photos are separated from the photos in Camera Roll, so you don’t have to worry about losing the photos they shoot after the sync of iTunes. However, if you have started the auto sync of iTunes, you will sync the whole iTunes library with your iPhone, and you may lose important files during the sync of iTunes. If you don’t want to use the auto sync of iTunes, you can shut it down by clicking iTunes > Preferences > Devices, and checking Prevent iPods, iPhones and iPads from syncing automatically. Of course, users can take advantage of the third-party iPhone transfer software for Mac to move photos from Mac to iPhone. Among all the transfer programs for iOS devices on Mac computers, Leawo iTransfer for Mac is regarded as one of the best. This software enables users to transfer files among iOS devices, iTunes and mac computers without the sync of iTunes, and users are able to transfer various kinds of files easily. The following guidance will show you how to transfer photos from Mac to iPhone, and you can free download this software to have a try. Note that the trial version has limited transfer times. Step 1. 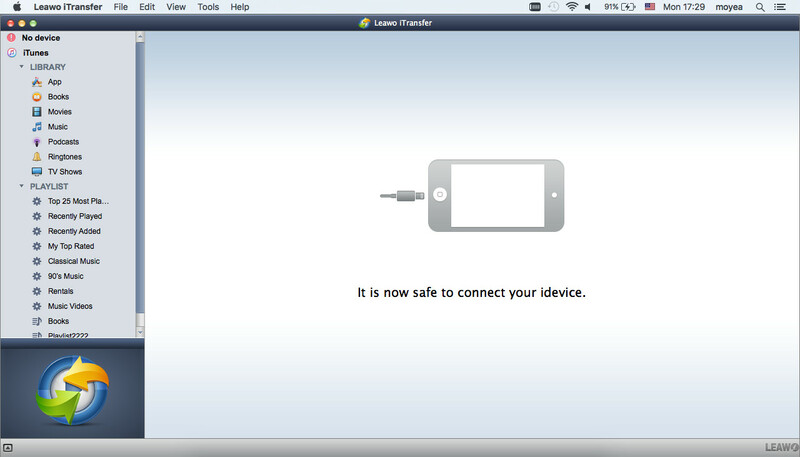 Run Leawo iTransfer for Mac and connect iPhone to computer with the USB cable. The software will automatically detect the libraries of iPhone, and then show the libraries in the left sidebar. Step 2. Click the name of iPhone and choose Photos library in the left sidebar. The synced photos on your iPhone will display in the right part of the software window. Step 3. Choose “Photos” library and then the contents will be shown in the right part of the window. If your iPhone Photo Library is empty, you will see an “Add File” button in the middle of the window, you can click it to add photos from your computer. If not, click “File > Add > Add File/Add Folder” to choose photos from your computer. After selecting your photos, Leawo iTransfer for Mac will start to copy photos from Mac to iPhone. The progress bar in the pop-up dialog will show you the percentage of the transfer process. When the photo transfer is finished, you will get the photos in your iPhone Photo Library. Leawo iTransfer for Mac has a Windows version called Leawo iTransfer. Both of the programs are helpful for the data transfers of iOS devices, for example, you can back up iPad data to computer with the help of this software. If you are interested in Leawo iTransfer, just free download it to have a try. 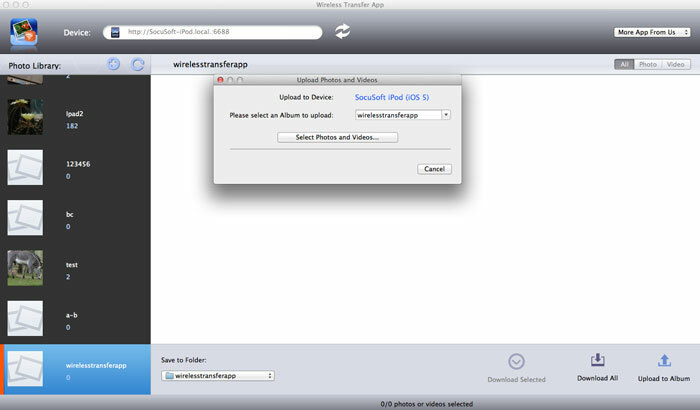 Wireless Transfer App is also helpful for users to transfer photos from Mac to iPhone. Wireless Transfer App helps you easily and quickly transfer photos between iPhone and iPad as well as download photos and videos from computer to iPad/iPhone/iPod. Using Wireless Transfer App, you can transfer photos and videos from iPad to iPad, from iPad to iPhone, from iPhone to iPad, from iPhone to iPhone, from iPhone to Mac, from Mac to iPhone and more. There is no need for cable or extra software. You just feel free to browse and download photos between devices. The following steps will show you how to transfer photos from Mac to iPhone with Wireless Transfer App. Download and install Wireless Transfer App on your iPhone. Then make sure your Mac and your iPhone are in the same Wi-Fi network. Run Wireless Transfer App on your iPhone. Open a web browser in your Mac (i.e. Safari, Firefox, Chrome) and type the http address as exactly shown in the “Receive” from PC screen. Find the “Upload Images and Videos” button in your web browser. Browse your Mac and move photos from Mac to iPhone. If the iPhone users have Dropbox installed on their iPhone and Mac computer, they can also take advantage of this app to sync photos. Users only need to log in Dropbox with one ID, and then copy the photos to the Dropbox folder on the Mac computer. Users will be able to view the photos in the Dropbox folder on their iPhone after the photos are uploaded to the cloud. The iPhone users will also be able to download these photos to their iPhone, and they only need to tap the photos in Dropbox folder to download.